I always wondered you know if you could have a bonus grandma who I would choose. I narrowed it down to two… Margaret Fulton or Maggie Beer. Either way i guess I am guaranteed a good Sunday dinner! Two real treasures of Australia if you ask me! So in came this opportunity into the email and I quickly shot it off to megs. The chance to review a kids cooking book and have one to give away to you our lovely readers – stay tuned below for more details on that side of it. We were thrilled to see we were chosen. 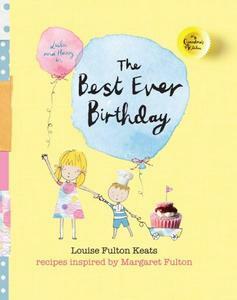 So when the book arrived I realised it was written by Louise Fulton Keats, Recipes inspired by Margaret Fulton! See louise really does have Margaret Fulton as a grandma! Now anyone who knows me, can attest my love of a party! Especially a kids birthday party! I already have plans for september and october this year 🙂 I have good memories of birthday parties growing up. I remember flicking through the Women’s Weekly Parties book and deciding on a cake… I have memories of many ice cream cakes too… Well done on the fine negotiating skills of my mum, who managed to get me into an ice cream cake 🙂 Well it can’t be denied the magic of a kids birthday! I have been reading the book with Ruby (Miss 4) and she is loving it – I think she shares my love of food, and a good party! Although her 5th birthday demand list is growing by the day! I might have to start planning now 🙂 Ruby decided that her favourite teddy comforter who is affectionately called “Sweetie Pie” was turning 4 today! And that a party was required! Luckily for her my brain was ticking over about this very post so I let her run with it! Next thing Nanna and Grandad were invited and we were all celebrating Sweetie Pie’s 4th birthday! I flicked through the book with her and we chose some recipes from a couple of the different themes. We settled on Pink Fairy Cakes, Chocolate Meteoroids and a Sparkly Green Frappe. The book is BEAUTIFUL! The story is based on Lulu, Harry and there dog Nutmeg, trying to decide on what sort of birthday party for lulu to have. It’s fun and imaginative. And better still for all the mummy’s there are all the recipes at the end. Even a great butter cake and butter cream icing recipe. And then ideas and recipes for 6 themed parties. Outer Space / Fairy / Dinosaur / Circus / Picnic and Fancy Chef’s Party. And I have a sneaky suspicion they have a thermy as all these recipes work brilliant in the thermy! 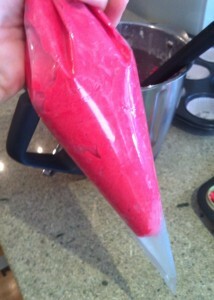 Firstly I made the Pink Fairy Cakes. The recipe was great, I will spoil the other two but you might just have to buy the book for this one 🙂 I thought I’d give you a couple of tips… I always have a pack of disposable piping bags in the cupboard. 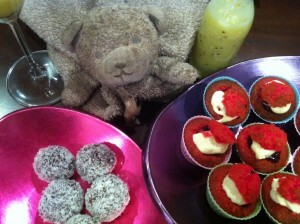 They are a couple of dollars from woolies and they make filling mini cup cakes SO much easier! You get an even finish and saves you a bunch of time! Better still you don’t need any of the attachments. Just stand it in the empty glass and then fill it and snip the end! Filled all ready to rock and roll! Now my other little tip! 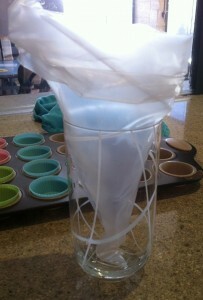 If your cooking with silicone. Double tray, meaning put your silicone onto a baking tray. This makes sure the heat reaches the bottoms and will cook evenly and give you a nice crisp bottom. Secondly I made these beautiful Chocolate Meteoroids – now seriously these are a match made in heaven for the good old thermy! Simply add 100g stonded dates, 170g Raisins (i didn’t have 170g so I used half cranberries) Blitz speed 9 till well combined. Add two tablespoons boiling water and let sit for 1 minute. Add in 50g Almond Meal, 2 tablespoons Cocoa Powder, 2 tsp fresh orange juice (I just used half an orange.) 1/2 cup desecrated coconut and mix for 10 seconds speed 4-5. 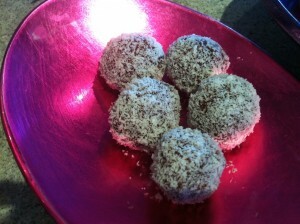 Roll into balls and roll through some extra coconut. Seriously this was sweet delicious and a great healthy substitute for chocolate! YUM! Big thumbs up!!! And better still they will keep in the fridge for a week! If they last that long! Next up we chose the Sparkly Green Frappe. It was yummy. And easy! 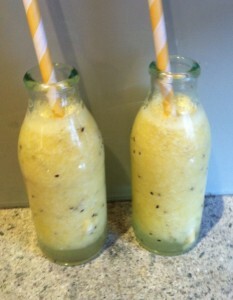 Just add 4 kiwi fruits (Skinned), Small handful of mint leaves (I left these out, will use them next time!) 500g Apple Juice, 500g Lemonade. First blitz kiwi fruits speed 9 for 5 seconds. Add remaining ingredients and mix for 20 seconds speed 7. Serve. I would probably add some ice next time as it wasn’t super cold. It was a tangy different sort of taste and was quite nice! I reckon you could switch the lemonade for some champagne… probably not for the 4 year olds! One very happy and well loved Sweetie Pie! The Best Every Birthday is available online Here and is $29.99 I love it – will definitely be using it more come birthday season! 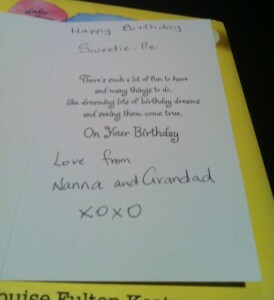 Oh and one last thing….. how cute is this 🙂 Look’s like Ruby hit the Jackpot in the Grandma Stakes anyway 🙂 Nanna and Grandad came to Sweetie Pie’s party with a present and a card 🙂 LOVE IT ! !